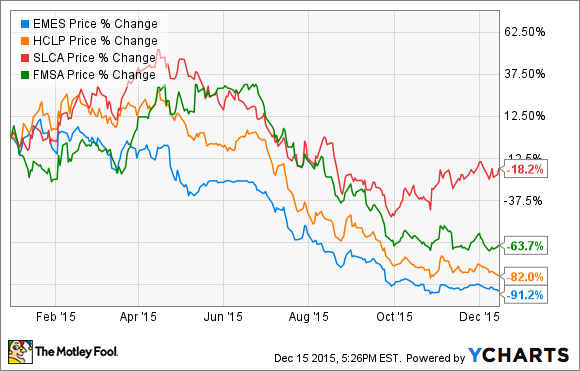 Emerge Energy was by far the worst-performing frack-sand stock of 2015. Find out why and, more importantly, what investors should expect in 2016 should the oil crash worsen. To say the worst oil crash in a generation has been rough on frack-sand stocks would be a major understatement. However, of the four largest U.S. frack-sand producers -- US Silica (NYSE: SLCA), Fairmount Santrol (NYSE: FMSA), Emerge Energy Services (NYSE: EMES), and Hi-Crush Partners (NYSE: HCLP) -- Emerge has had the roughest year by far. Let's look at three things investors should expect in 2016 and, most importantly, whether this badly bloodied MLP is still a good long-term investment. Source: Emerge Energy Services investor presentation. Collapsing oil prices have caused the number of U.S. oil rigs to fall 67% from their October 2014 highs, which has caused demand for frack sand to decline dramatically. This situation has taken a brutal toll on Emerge's margins and caused its distributable cash flows -- which funded its variable distribution -- to come in at negative-$4.5 million in Q3 2015. That was the primary reason Emerge suspended its distribution this quarter. However, even if frack-sand profits improve in the coming quarters, it's not necessarily true that Emerge Energy will reinstate its payout. That's due to ongoing challenges caused by a high debt load. Even though Emerge Energy Services doesn't have the highest debt of America's four largest frack-sand producers, given its recent debt covenant renegotiation, its rising leverage ratio could pose an existential threat in 2016. That's because Emerge Energy's falling EBITDA recently caused its total leverage ratio -- debt/TTM EBITDA -- to exceed its previously agreed upon debt covenants of 3.5. The MLP's creditors agreed to amend its debt agreements to suspend such covenant ratios through either June 2018 or until Emerge experiences two consecutive quarters with a leverage ratio under 3.5. While that gives Emerge Energy plenty of breathing room to wait for a potential recovery in crude prices, the deal comes with certain requirements that mean that the MLP's survival is far from certain. No mergers or acquisitions that require additional debt. No distributions until the leverage ratio is under 4.0. Maintaining an excess borrowing capacity of at least $43.75 million, or 12.5% of outstanding borrowing capacity. Generating certain minimum quarterly EBITDA amounts beginning in Q4 2015. Growth and maintenance capital expenditures limited through 2019. Source: Emerge Energy Services 10-Q. The biggest risk for Emerge is the minimum quarterly EBITDA requirement, a clause that also can be found in Hi-Crush Partners' recently amended credit agreement. Should oil prices fail to recover in 2016, then frack-sand producer EBITDA will probably fall as well. Thus Emerge may once again find itself in breach of its debt covenants, creating the risk that its lenders might call in its loans and potentially bankrupt the MLP. How likely is such a "lower for longer" oil scenario? While predicting short-term oil price movements is pretty much impossible, there are several reasons to believe that oil prices may remain low in 2016 or potentially fall even lower. According to the International Energy Agency, or IEA, the world's supply glut of oil is currently 1.62 million barrels per day, or BPD. For oil prices to rise strongly and sustainably, that glut will need to be eliminated through falling production and rising demand. The risk of a growing oil glut in 2016 is increased by the fact that the IEA expects 2016's global oil demand to rise by only 1.2 million BPD while non-OPEC production is expected to decline by a mere 0.6 million BPD. I continue to view Emerge Energy Services as a deep-value investment, but be aware that while the recent credit-agreement amendment decreases the odds of a business failure, Emerge still remains a very speculative stock. Given its high debt levels and the possibility that oil prices could remain low for several more years. Those seeking a less risky frack-sand stock should look at US Silica because of its strong, cash-rich balance sheet and low leverage.